I'm so excited to be partnering up today with my friends at White Plum to bring you guys this amazing giveaway! In case you're not yet familiar with them, White Plum is a women's fashion and lifestyle brand based in Northern California that offers a full line of adorable clothing and accessories. (Their day dresses are my personal favorite - so cute!) Recently they started to branch out and carry shoes, home goods, and private label items as well. In just over a year, they've grown from being a home-based Etsy business to a well-known brand with multiple offices, a warehouse, and over 30 employees! Their story is a dream come true, and I'm thrilled to be working with them. 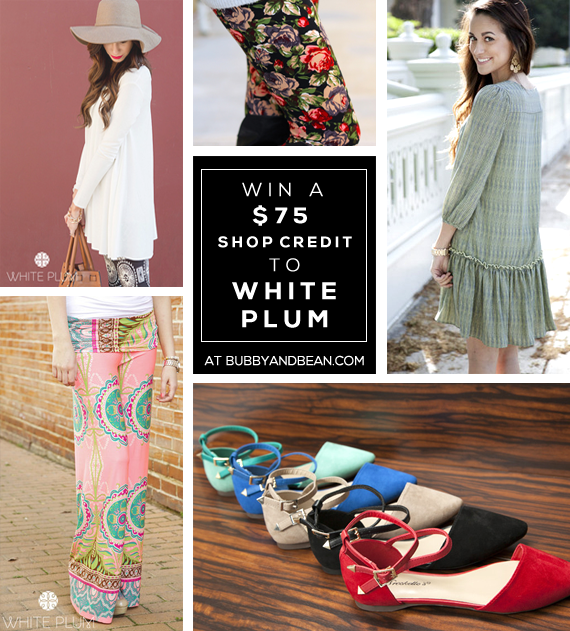 For this giveaway, White Plum is offering Bubby and Bean readers the chance to win a $75 shop credit to go shopping on their website. With their incredible selection and super affordable prices, the winner is going to feel like she/he is on a shopping spree! And after you enter, treat yourself to something in the White Plum shop with this amazing discount: use code BUBBYBEAN20 for 20% off your entire purchase, through June 19th. For this giveaway, White Plum put together a Rafflecopter form for you to use. Just use the convenient form below to enter. You can gain up to 8 entries! This giveaway will run through June 19th and is open to Bubby and Bean readers worldwide. The winner will be randomly chosen and announced here shortly after. Thanks again to White Plum for giving Bubby and Bean readers the chance to win a gift card to their beautiful shop! (And don't forget to take advantage of their generous coupon: use code BUBBYBEAN20 for 20% off your entire purchase, through June 19th.) Good luck! Congrats to White Plum on their Etsy success story! Thanks for the giveaway. So much to choose from such wonderful collection, I'd go with Wine Country Maxi Dress. I adore Cortez embroidered maxi dress. Beautiful shop! I love the prim and proper maxi skirt! Great styles in their shop! I love the Terceira Tunic Dress, but it's sold out white. I love the Prim and Proper Maxi Skirt. So beautiful! I like the Half Moon Bay dress! I like the LIGHT WEIGHT POCKET TUNIC. i love the whitney tunic dress!!! I love the Terceira Tunic Dress! LOve the chevron maxis and the layered beaded necklaces! I love the Verona pointed flats. I really love the Mayfair flats! I love the Kaylee Tunic! I hope it's my lucky turn this time, because I LOVE this shop! jessica chan: i like the Galilee Bracelet! I love the taylor lace and back day dress or the hayworth dress. I love the Hayworth dress. I love the San Michele Day Dress. It is absolutely gorgeous, and it would be perfect for one of our folky band gigs! So excited! I love the Walk in the Park flats! the day to night dress! One item that I really like is the Barbadoes Sleeveless Top. I love that Aimee Fit and Flare Skirt. So pretty! Thanks!! I love the Terceira Tunic Dress. Thanks. Ah, thank you for sharing this! I've never heard of them before and am already in love with their clothes! The Jessica Day Dress is adorable. looks so light and comfy! I absolutely fell in LOVE with that dress!!!!!!! Love the Aria Studded Blouse-so pretty. Hello! Super cute shop! One of my favorite items is the Neon Floral Peplum Blouse. So pretty. Thank-you!! Pearl Metallic Palazzo Pants! But its sold out!Unfortunately!! I like the laura blouse! I Like the Santa Barbara Tunic. PRETTY AS A PEACH PALAZZO PANTS is my favorite! But I like so much more! Absolutely love the Miami Aztec Dress. http://www.whiteplum.com/products/miami-aztec-dress. Perfect for the summer! Love the prim and proper maxi skirt, such great clothes. I adore the Butterfly and Tulip Marilyn Dress. I love this dress http://www.whiteplum.com/collections/day-dresses/products/hayworth-dress on both colors! Love the Lucy polka dot dress! I'm really loving the RICHMOND PARK MAXI DRESS! Excited for the giveaway!! Thank you! I adore the Dream TUnic!! The flats are so lovely in these colors! Definitely my favorites! I love the garden Promenade flats... Picking a favorite color is difficult! I like the Mojave Tunic . I love the Classic Crochet Maxi! So pretty, and exactly my style! I love the Ana Lucia Tunic Dress! I love the Verona Pointed Toe Flats! I love the Phoebe Shift Dress! I just love the Oriental Garden Boyfriend Maxi dress! The Nantucket belted skirt is my favorite! Thanks for the giveaway! I love all of the palazzo pants. Though I think the Grecian or African Safari are my favorite!!! I love the tribal crotchet day dress! The Ana Lucia tunic is so bright and pretty! I positively love it! Zenaida lace dress is one of my favs! Love the West End bag - great pop of blue! Digging the Grecian Palazzo Pants! Come Fly With Me Dress! The winner will be announced this week.